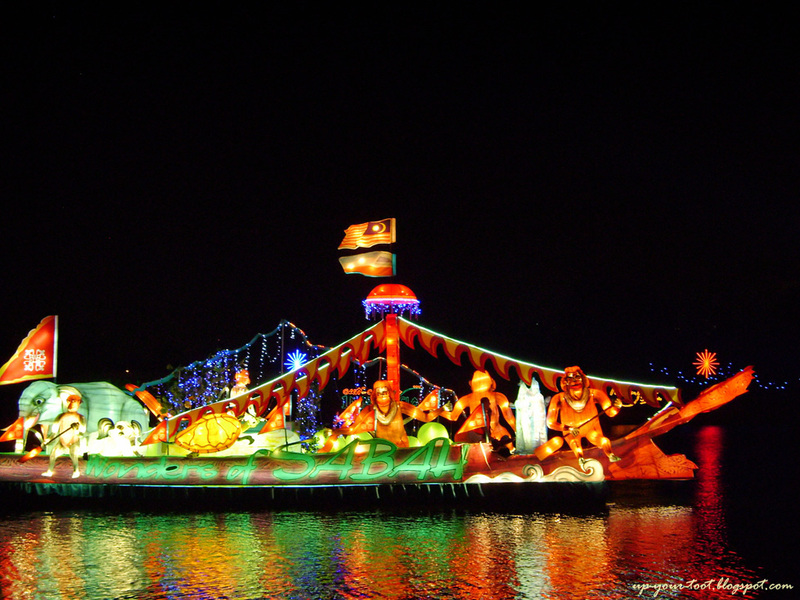 Here is the second part on the floats for the Floria 2012 1Malaysia International Night Floral Parade called The Magic of the Night. 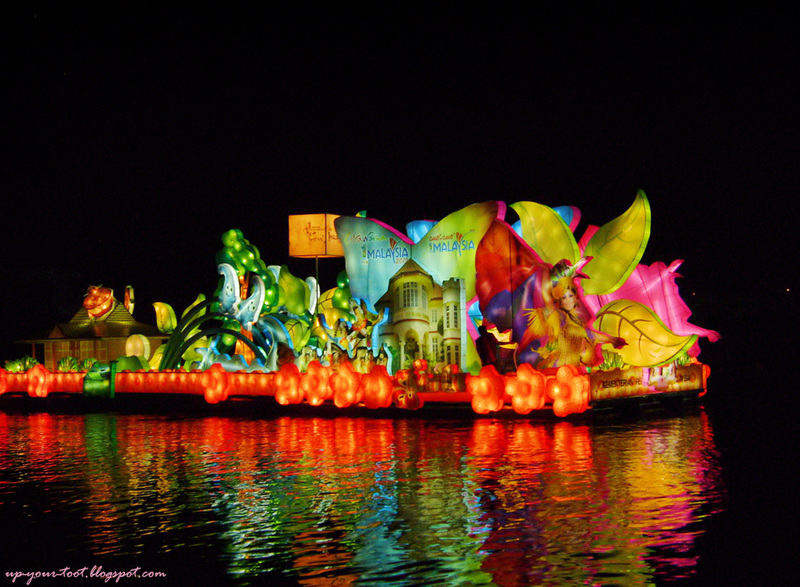 If you came here directly, do look at the first part of this post - Floria 2012 Magic of the Night. 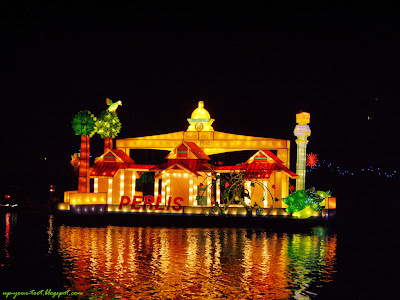 So after the rather disappointing float from the state of Perak, next in line is the float from Perlis, the smallest state in Malaysia. At the bow of the boat are some mangoes, representing one of the well-known produce from this state. 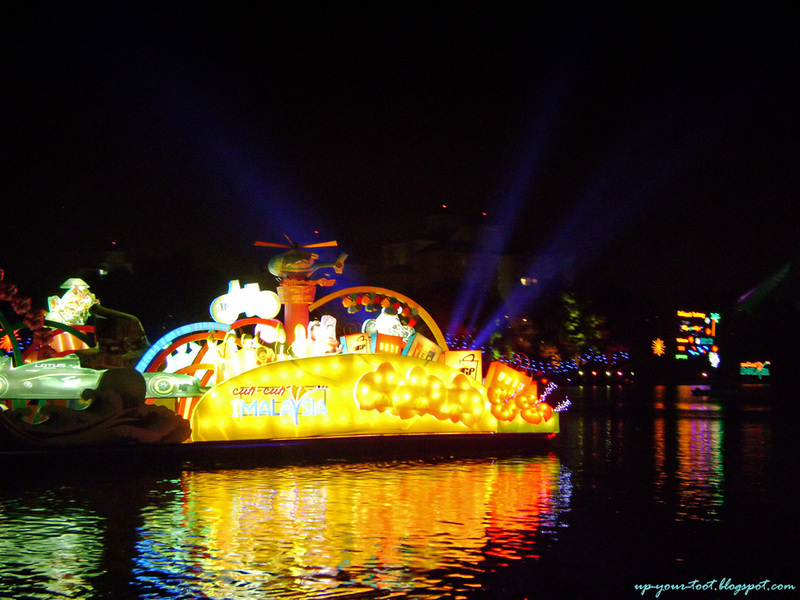 Simple, but bright and definitely more attractive than the very subdued lighting in Perak's floats. The bright yellow boat from Perlis. Then we have the float from Sabah. I must say this is quite an attractive float, and prominently features the Orang Utan, Proboscis monkey, the pygmy elephant, turtle and an outline of Mt. Kinabalu, which represents various natural attractions found in the state of Sabah. The float from Sabah sailing towards us. 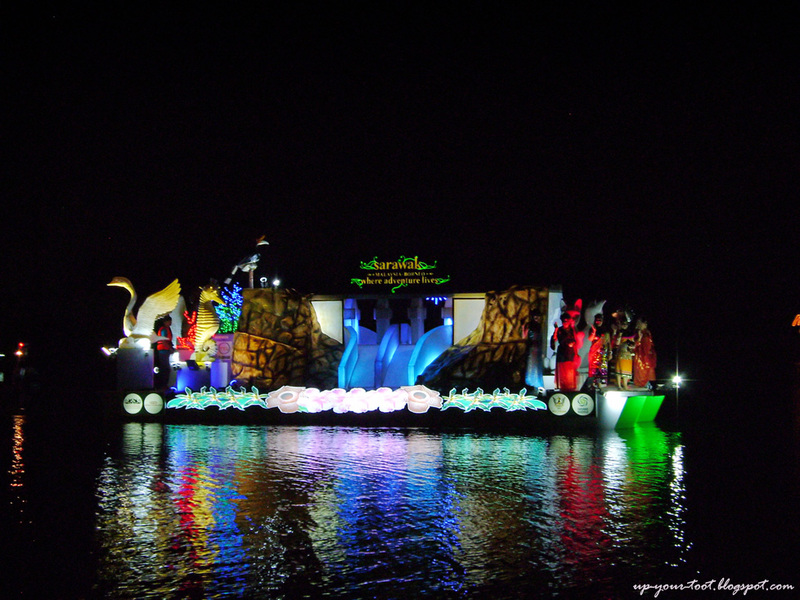 The orang utan, proboscis monkey, the pygmy elephant, turtle and Mount Kinabalu were featured in this float. We were then entertained with the float from the neighbouring state of Sarawak. A hornbill is visibly perched on top of the boat, and on the bow end, six local ethnic groups were being represented by 6 people dressed in their respective traditional dress. Two cats (partly blocked by the party of 6 people) represent the state capital, Kuching. 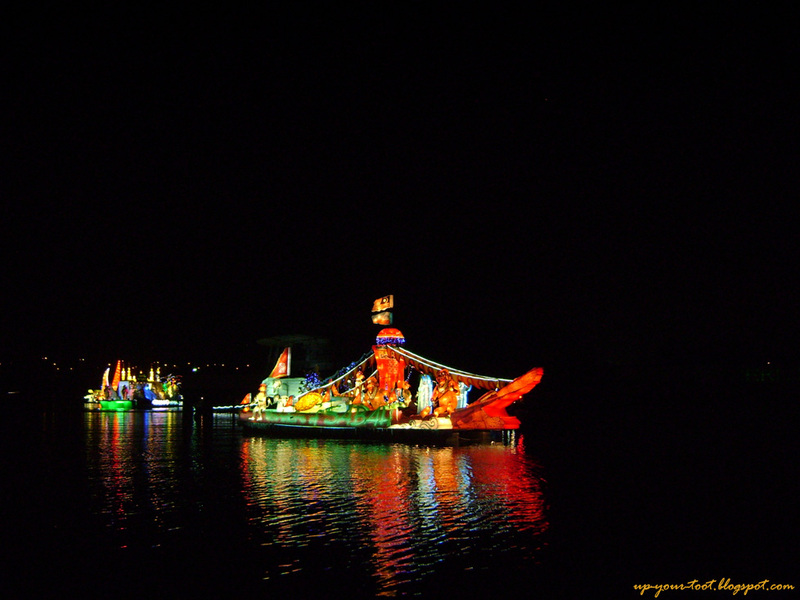 The sluice gates (lighted blue in the middle) represents the Bakun Dam, and the seahorse is to represent the town of Miri, where petroleum was first found and extracted in Sarawak. The float from Sarawak, with representatives of 6 different ethnic groups standing at the bow end of the ship in traditional dresses. 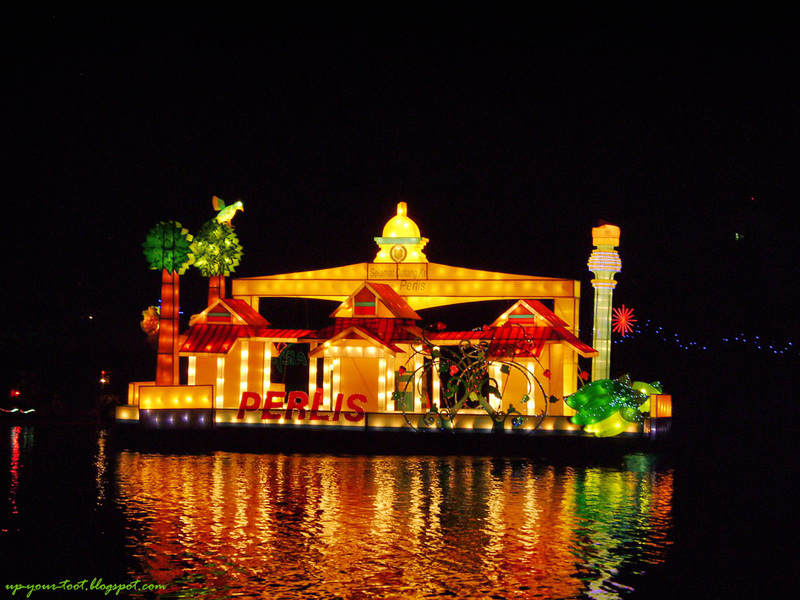 We return back to Peninsular Malaysia with a float from the state of Terengganu. Sails are prominently featured - the Monsoon Cup at Pulau Duyong. There is of course a representation of the mosque - another prominent feature of Terengganu. Since Terengganu is also home to several diving sites, there are depictions of reef fishes and turtles. 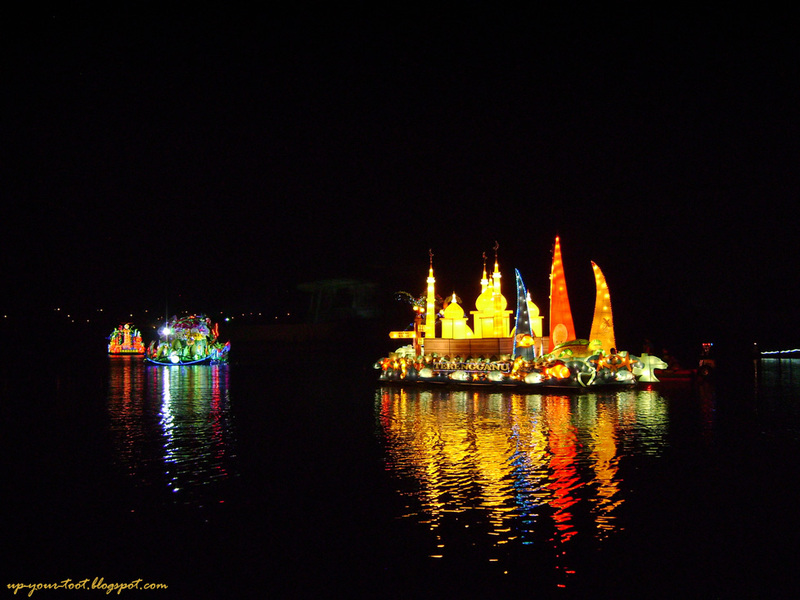 The sails and mosque on the float from Terengganu is very visible. 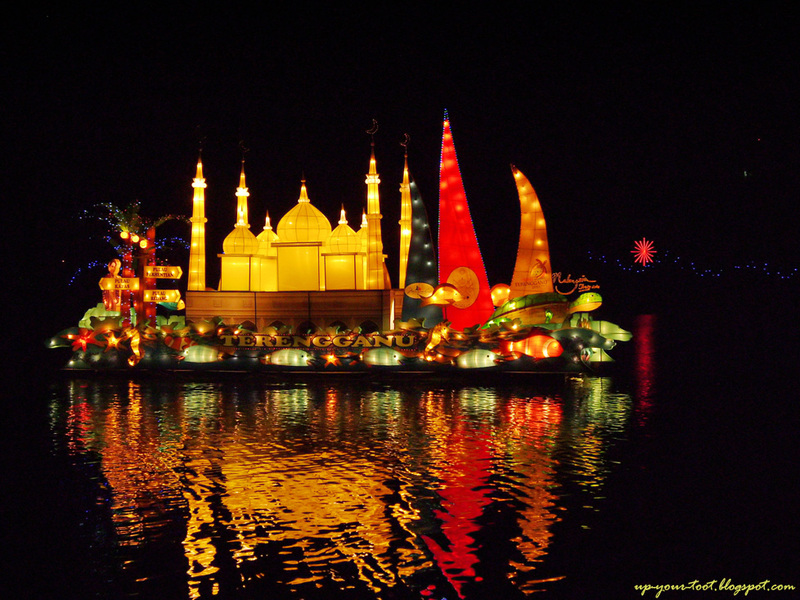 The turtle and reef fishes, plus the brightly lit mosque and sails gives this float from Terengganu quite a visual appeal. Next is the float from Perbadanan Putrajaya. The theme of the float is a garden city concept, which is what Putrajaya aims to be. With fishes in front, flowers and butterflies, the float was quite an intriguing one. Also, the boat had water spouting from the sides and plumes of dry ice smoke poured from the top and the front of the float. There were 'human butterflies' on board too, both male and female ones flapping their wings whilst waving their hands at the audience. Fishes, butterflies and flowers from Putrajaya. Tourism Malaysia also fielded a float. The float showcases what Malaysia have, i.e. the sporting events like the Le Tour de Langkawi, the F1 and other motor sport events. Prominently featured are large shopping bags that screams Malaysia is a shopping paradise! Shopping bags and sports event featured prominently in the float from Tourism Malaysia. The last float is from the Ministry of Tourism, Malaysia. More of a space filler (to make up for the number of participants), this float despite being highly visible, leaves an unremarkable impression on most of the audience. Perhaps it is also the last float and everyone is anxious to see the fireworks display after the parade. The float from Ministry of Tourism Malaysia. It was quite a sight, especially when the float line up across the lake at the end of the parade and the fireworks come on. Sunday (8th July) is the last day, so do go to Floria 2012 (even if you do not like flowers and plants) and have a look or else you might regret missing on this event. I would like to apologise for the slow updating of pictures as I was having a rather tough week. UPDATE: The Best Decorated Float went to the float from Suzhou, which is what most people would have expected. 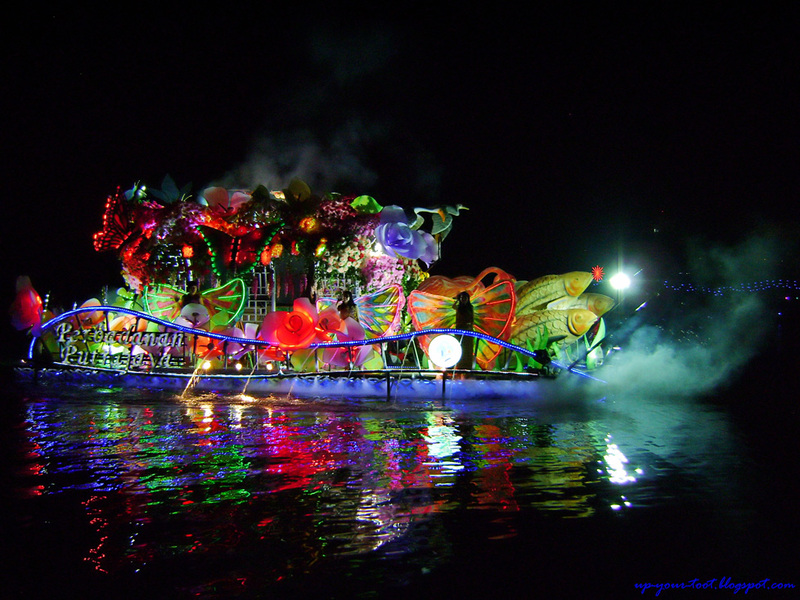 The next Floria (Floria 2013) is scheduled for 22 - 30 June 2013, so do put in down in your planner if you've missed this year's event. I think the floats are very colourful but too brightly lit or maybe there are too many lights placed too closed together, like OTT (over the top). The reflections on the lake is beautiful though. As for the fireworks display, we have to find a place on higher ground far from the lake so as to get a good shot of the whole scene. I wonder where? You are right, some of them are really OTT. Hmm, perhaps at the parking lot? Too bad the area is quite flat. Thank your for sharing, bolehlah juga enjoy even we can't be there :). Phew...packing done and dah angkat today, next week leave port kut. All my postings has been scheduled, automatic je (dari balik Melbourne sibuk packing je). Takpe, probably next year you should be able to enjoy it at Putrajaya yourself. Must be a relief for you to get the packed stuff cleared off. So how long more before working full time at kebun sg buloh? Bolehler buat visit, hehe. Btw, the Ixias are just coming out. I probably killed some coz left it when I went to Penang with no water. Dahlah cuaca panas masa tu.